(Nanowerk News) Measuring faint magnetic fields is a trillion-dollar business. Gigabytes of data, stored and quickly retrieved from chips the size of a coin, are at the heart of consumer electronics. Even higher data densities can be achieved by enhancing magnetic detection sensitivity---perhaps down to nano-tesla levels. Greater magnetic sensitivity is also useful in many scientific areas, such as the identification of biomolecules such as DNA or viruses. This research must often take place in a warm, wet environment, where clean conditions or low temperatures are not possible. 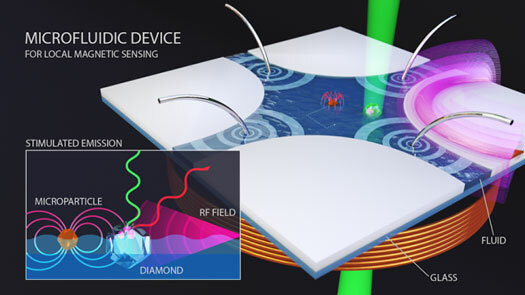 JQI scientists address this concern by developing a diamond sensor that operates in a fluid environment. The sensor makes magnetic maps (with a 17 micro-tesla sensitivity) of small particles (a stand-in for actual bio-molecules) with a spatial resolution of about 50 nm. This is probably the most sensitive magnetic measurement conducted at room temperature in microfluidics. The results of the new experiment conducted by JQI scientist Edo Waks (a professor at the University of Maryland) and his associates appear in the journal NanoLetters ("Scanning Localized Magnetic Fields in a Microfluidic Device with a Single Nitrogen Vacancy Center") . At the heart of the sensor is a tiny diamond nano-crystal. This diamond, when brought close to a magnetic particle while simultaneously being bathed in laser light and a subtle microwave signal, will fluoresce in a manner proportional to the strength of the particle’s own magnetic field. Thus light from the diamond is used to map magnetism. How does the diamond work and how is the particle maneuvered near enough to the diamond to be scanned? The diamond nanocrystal is made in the same process by which synthetic diamonds are formed, in a process called chemical vapor deposition. Some of the diamonds have tiny imperfections, including occasionally nitrogen atoms substituting for carbon atoms. Sometimes a carbon atom is missing altogether from the otherwise tightly-coordinated diamond solid structure. In those cases where the nitrogen (N) and the vacancy (V) are next to each other, an interesting optical effect can occur. The NV combination acts as a sort of artificial atom called an NV color center. If prompted by the right kind of green laser, the NV center will shine. That is, if will absorb green laser light and emit red light, one photon at a time. The NV emission rate can be altered in the presence of magnetic fields at the microscopic level. For this to happen, though, the internal energy levels of the NV center has to be just right, and this comes about when the center is exposed to signals from the radio-frequency source (shown at the edge of the figure) and the fields emitted by the nearby magnetic particle itself. The particle floats in a shallow lake of de-ionized- water based solution in a setup called a microfluidic chip. The diamond is attached firmly to the bottom of this lake. The particle moves, and is steered around the chip when electrodes positioned in the channels coax ions in the liquid into forming gentle currents. Like a ship sailing to Europe with the help of the Gulf Stream, the particle rides these currents with sub-micron control. The particle can even be maneuvered in the vertical direction by an external magnetic coil (not shown in the drawing).